LIMA, OH (June 30, 2012) - South East Harley-Davidson rider Sammy Halbert survived a late-race re-start and a last-lap challenge to win the AMA Pro Harley-Davidson Insurance Grand National Championship flat track event at the Allen County Fairgrounds after Harley-Davidson® Screamin’ Eagle® Factory Team rider Kenny Coolbeth was injured on the first lap of the main. According to Harley-Davidson Racing Manager Kris Schoonover, Coolbeth was struck on the lower leg by a flexible marker placed on the inside of the track to keep riders away from a wet area of the racing surface. A rider ahead of Coolbeth hit the marker and knocked it off its anchor. Coolbeth did not crash, but rode directly to the track’s medical team. He was transported to Lima Memorial Health System, where doctors identified fractures of the tibia and fibula. Coolbeth will remain at Lima Memorial for observation until at least July 2. Schoonover said it is too early to speculate on Coolbeth’s recovery timetable. Halbert took the lead and control of the race on lap 11 of the 25-lap main when he passed Zanotti Racing/Schaeffer’s H-D rider Jake Johnson and Scott Powersports Kawasaki rider Johnny Lewis. By lap 16 Halbert enjoyed a 2.6-second lead over Johnson and maintained that lead until the race was stopped on lap 20 for the crash of Werner Springsteen Racing rider Brandon Robinson. Following the re-start, Foremost Insurance Group Ducati rider Henry Wiles closed in on Halbert, and the riders collided in turn three of the last lap as Wiles got in front of Halbert. Halbert recovered to re-pass Wiles in turn four and take the win by just 0.220 seconds. Johnson was third, 1.409 seconds behind Halbert, followed by Rogers Racing/Blue Springs Harley-Davidson rider Jared Mees and Lewis. 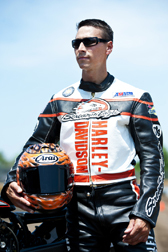 It was the second consecutive win on the Lima half-mile for Halbert, who rode a Harley-Davidson® XR750 motorcycle. Earlier in the evening, Wiles won the five-lap Dash for Cash sprint bonus race. After five of 16 AMA Grand National events, Mees leads the series with 93 points, followed by Johnson with 82 points, Lewis with 81, and Halbert in fourth with 77. Coolbeth is in eighth place with 57 points. The next race on the Grand National schedule is July 7 on the Hagerstown Speedway half-mile in Hagerstown, Md. The Harley-Davidson Screamin' Eagle Factory Flat Track team is sponsored by Matco Tools.